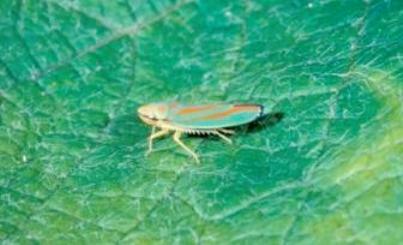 Region: This leafhopper is found throughout North America. Life cycle: This insect produces one to three generations each year and overwinters in garden rubbish. Physical Description: This 1/3 inch insect is bright green with red, green, or blue band. It has green wings and the thorax has red stripes, yellow head and legs, wedge shaped body. Feeding characteristics: The adults and nymphs will attack many garden vegetables by feeding on the foliage, but they do not cause serious harm. This leafhopper secretes a substance "honeydew" substance, which contains a lot of sugar, often causing ants to care for them as they do aphids. Controls: No controls are necessary, damage is usually minimal.